The Hospice House Foundation of WNC, was established in 2005 as an all volunteer not for profit organization. Our mission is to obtain funds for the construction and endowment of an inpatient facility for our community and to support hospice. Front row: Evie Byrnes, HHF Vice President; Michele Alderson, HHF President; Shelton Boren, certified hospice therapy dog for Four Seasons Hospice; Mark Twisdale, SECU Executive Vice President of Administrative Services; Barbara Walls, SECU Senior Vice President; Mike Williams, SECU Franklin. 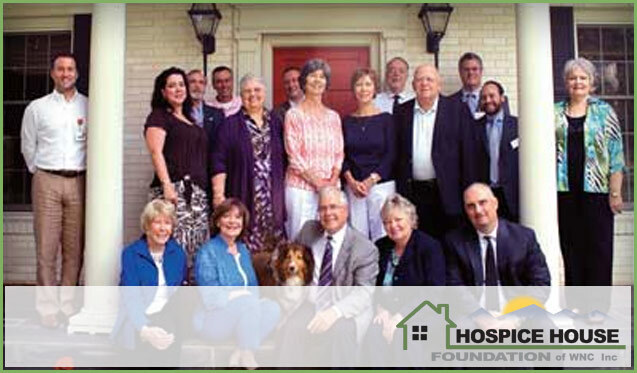 Second row: Derek Groves, Four Seasons Hospice Vice President of Sustainable Resources; Elise Boren, HHF Capital Campaign Chair; Cindy Miles, HHF Board Member; Sallee Coss, HHF Secretary; Ann Dryman, former owner of the Hospice House property; Larry Dryman, former owner of the Hospice House property; Sara Stevens, HHF Board Member. Back row: Dr. Ron Fisher, HHF Board Member and Westcare Hospice Medical Director; John Baldwin, HHF Capital Campaign Co-Chair; Mike Garner, Four Seasons Hospice Volunteer Coordinator; Jim Lau, HHF Board Member; Steven Mills, Four Seasons Hospice Director of the Western North Carolina office; Mark Goldstein, Mark Communications President.